The following 'View', otherwise known as the 1589 Terrier, is a description of the lands paying Tithes to the Parsonages of Yeovil and Pitney from a survey undertaken in the 32nd year of the reign of Queen Elizabeth. The word 'terrier' derives from the Latin terra, meaning land. A view of the Parsonage of Yeovil and Pitney taken 28th Sep in the 32nd of the Reign of Queen Eliz(abe)th by the Jury within written. Edward Maleins Gent. John Hacker Senr. Thomas Phelps, John Dier, William Ford, William Jennings Senr. Matthew Hacker, Thomas Williams, (illegible) George Haine, Thomas Whibbye, John Whibye, Robert Jeanes, Egidius Salmon, John Thorne, William Grobham. Imprimis - upon Dodom by Estimation 65 acres out of which at present is eared and Sown the sum of 15 acres the rest is furzey and fern ground of which ground the tithe of three yards lying 2 acres breadth from Cakebridge and shooting down from Newton Bridge to the Water as appertaining to the Parsonage of Pitney 64 Acres one Yard to the Barne. Item - from Frogg Mill up to the Back Street next to Hendford and from thence to Forestreet bridge 16 Acres pasture, 1 Acre and half arable Rectory de Yeovil id est 17 Acres and half. It(e)m. Upon the south side of Vennel from Forestreet bridge to Penneway 24 Acres whereof 4 Acres of pasture lying next the water, the rest arable whereof 2 Acres belong to Pitney, one Acre next Penneway the other in the same furlong. the next being 22 Acres belong to Yeovil Parsonage. Item - the North side of Kingston Penne (today's Wyndham Hill) from Penneway to Yeovil bridge and so bounding next to Broadford Leaze to the (word illegible) Weare is 64 Acres, whereof 13 Acres is meadow 12 pasture, 3 Acres Ferne Ground the rest 36 Arable whereof one acre and half belongeth to Pitney, the acre lieth in the middle of Matth(ew) Hackers close next the Gore, the half acre in John Tuckers Close being the Headlane next the way, to the Barne 62 Acres and half. It(em) - from Meadway Gate, the lower part of the way, unto Rickless Gate, and from thence to the great river, and so to Yeovil bridge being Dichelmoor containeth 80 Acres or thereabout whereof 23 Acres are of meadow 8 Acres are pasture, the rest 49 Acres arable of the which 21 Acres and one Yard belongeth to Pitney whereof 6 Acres of the same meadow lieth on the north side of Penmill 9 Acres lieth in three several meadows adjoining to the said six Acres in the North part, 6 Acres and one yard of Arable lying in the lower part next the Meadway (the southern end of today's Lyde Road) one half acre lieth in the north side next the first Double Wale, one half acre more lying on the south side of an Acre pertaining to the Almshouse of Yeovil in the said Furlong and 5 Acres and one yard lying on the north side of the said Acre of the Almshouse so there lieth to the Barn of Yeovil 41 Acres. Item - from Reckless Lake in the outpart of the Meadway unto the River before Compton Mill bounding upon the Lands of the Lord Sturton in the north part right before the Meadway by the River towards Yeovil bridge und upwards being part of the Down & no more bounding upon the River containing by estimation 53 Acres whereof 16 Acres of Meadow 2 Acres of Pasture 2 Acres and 3 Yards of Arable, or thereabouts pertaining to the Parson of Yeovil 12 Acres of which meadow 12 Acres of Pasture boundeth upon the River 2 Acres of meadow lieth joining to the meadow at Reckless Lake and one Acre of meadow being doubtful, 2 Acres and 3 Yards Arable adjoining to the same mead at Reckless lake so that there remaineth to Pitney 32 Acres and half, and one Yard. Item - from the River before Compton Mill from the lands of the Lord Sturton to the upper part of Meadway to Reckless lake and so upwards to the lowest part of Hards Mead and from thence upwards between the lands of Thomas Phelps the east side and the lands of Francis Beacham on the west side, bounding to Stoney lake and from Stoney lake down by Lydegurl to the Great River, and so upwards from the great River to Compton Mill aforesaid being the next of the Down, and Harder Mead hill bounding upon Lide containing 218 Acres or thereabouts, whereof 97 Acres belongeth to Pitney, whereof 20 Acres of Meadow lieth next to the Great River. In Newclose and Coxclose, 34 Acres and 29 Acres of Arable together upon the Down bounding upon the Meadway, Half an Acre of Bowles lying against Coxclose, Half an Acre of Williams Fords in the middle furlong upon the Down, one acre in the same Furlong called the Squire Acre 2 Acres and half in Andrews Close shooting to Lide Half an Acre in W. Moleins Close at the same place one Acre 3 Yards (word illegible) to Reckless Lake in Mr Moleins Close, 8 Acres in Ralph Willis Close, one Acre at Hardermead hill shutting upon Reckless Lake 3 Yards in William Fords Close, upon the same hill the rest to the parsonage of Yeovil 121 Acres, 154½ to Pitney. From Stone Lake between the lands of Thomas Phelps and Francis Beacham aforesaid upward, to Lide gate, and from thence to the lower end of Swincombe and up to the Beacon and so down to Longdown bush by the lane, to the lower end of Hardermead, containeth 227 Acres, or thereabouts of the which the parsonage of Pitney hath 68 Acres lying in Swincombe, 28 Acres in a close of his own Glebe, 15 Acres at Spitcroft, 3 Acres in another close of his own, One yard in Giles Tuckers Close, in John Rushes close at Longdons bush half an Acre in Roger Withels close at the same place One Acre and half in John Francis close, one Acre and half in George Harrisons close, one Acre and one Yard in Edith Suggs Close at Gallpits 2 Acres in Reinolds close next Lide, 2Acres in William Jennings Close next Lide 3 Acres and half in Francis Beachams close, there 3 Acres in Joan Hackers close there 3 Acres in William Fords close at Harder mead 2 Acres and half in Edward Moleins mead there Acre. The rest being 159 Acres pertaineth to the parsonage of Yeovil, whereof 16 Acres are meadow 56 Acres of pasture, of arable 92 Acres. From the upper part of Harder mead down to the corner of Gore and in the East field to Reckless Lake and to the upper part of Hardermead containeth 106 Acres, of which the Parson of Pitney hath 18 Acres and half lying in the furlong suting down upon the Meadway of Thomas Williams land, one acre, one acre lying in the higher side of the Lake whereof two shaves goeth to Pitney and one sheaf to the parsonage of Yeovil. Item - in John Batchelors Close next Harder mead 4 Acres in T Crockers piece of Ground next Hardermead 9 Acres in Edmund Willis' Close next to Sellings lane one acre of Jn Cockles next to Bowdens Close, upon Sellings one acre & half, the next being 87 and half appertaineth to the parson of Yeovil, Viz - of meadow 2 Acres, of Pasture 9 Acres, of arable 76 Acres and half. From Gore corner next the Highway to Goldcroft lane end and up to Milkeford lane end, and from thence to Langdon's bush contained 147 Acres of which the Parson of Pitney hath 18 Acres & one Yard Viz lying in William Jennings Close at Sellings 2 Acres and one Yard in Alice Haines and John Francis Close upon Ryalls two Acres whereof one sheaf goeth to the Parsonage of Yeovil the other to Pitney. In the said Close of Alice Haines 2 Acres and half of William Jennings in Ryalls 4 Acres and half In Edw(ar)d Moleins close 3 Yards, in Edith Tuckers close half an Acre, in Edw(ar)d Moleins close upon Beer hill 2 acres In John Vicars close at Milkford lane 4 Acres, in Thomas Phelps close at Milkford 3 yards the rest being 128 Acres and 3 Yards appertaineth to the Parsonage of Yeovil, Of mead 9 Acres, pasture 70 Acres arable 49 Acres 3 Yards. Containeth 240 Acres or thereabouts appertaining to the Parsonage of Yeovil Of Meadow 20 Acres, of arable 80 Acres and of Sheep pasture 140 Acres. Containeth 445 acres of arable 352 acres meadow 20 acres pasture 73 acres, all the Tithes whereof belongeth to the Parsonage of Yeovil. There doth belong also of Glebe land to the said Parsonage lying within the said Preston two Cottages with 35 acres of land appertaining to the same which are parcel of the number of Acres in Preston abovesaid. From Goldcroft lane to Sparrows lane, and so to Milford lane end, at the end of Haines end is 35 acres and 3 Yards, whereof from Jno Diers close called the Pound-close to Sparrows lane are five Orchards and two little piekes of Pasture counted by Estimation 7 Acres and 3 Yards lying next the way at Haines end in J Kings Close to the Parsonage Barn of Yeovil the next being 28 acres to the Parsonage of Pitney. Yeovil 7 Acres & 3 Yds. From the Hayes end to Greenscross between the two Highways 26 acres and 3 yards of arable land all to the Parsonage Barn of Yeovil. From Milford Lane end to the Beacon and from thence by the Furzehedge to Langdons bush and from thence down to the same Lanes end 84 Acres whereof 20 acres of pasture 11 Acres meadow and the rest now 40 Acres of Arable and thereof belongeth to the Rectory of Pitney the Tithes of 13 Acres Counted as followeth. Viz - In the Parson of Pitney Close in the middle thereof one Acre and one other Acre next adjoining same one Acre arable. In the South Part of Strawbridge close one acre in William Jennings close 4 Acres on the north part thereof in the middle of Giles Tuckers close upon Hangerlane one acre. in John Nicks close 3 Yards on the north side, in John Kings close in Bramble Furlong 3 Yards at three several places between the ways one acre, late Salmons in Rickleford and in Robert Bakers close one Acre next the way one acre without the same close late in the tenure of the Widow Crow, so there remaineth to the parsonage barn of Yeovil 71 Acres. From the lower end of Hollans at the Townsend unto Marshwicke and from thence to Hundred Thorne and from thence down to the lower end of Sparrow lane bounded with the Highways on every side 117 Acres whereof 11 Acres of arable land 3 Acres of Meadow and 4 Acres pasture and thereof belongeth to Pitney 18 Acres and one Yard Viz - Edw(ar)d Wilsanes close 2 Acres and half. in Brooks close half an Acre next to the Wale on the West side saving half and Acre, 2 Acre on the west part of Giles Tuckers piece above Delswood, and half and acre by Treem Cross late Androsses one Acre in Jacobs ground next to his hedge except one Ridge one yard. In the middle of Rogers Withells close late Andrews's one Acre. in Thomas Phelps's close near Marshweech late William Sillys 3 Yards. in Thos Phelps's called Coomstreet on the west part next his hedge 2 Acres, 2 Acres in the same close on the East part and 2 Acres in Brooks close on the west side near to Hundred Thorne, One Acre of Thos Williams above Greencross one Yard. In the west side of William Fords land late Thos Williams one acre and half, next Hillon path late William Jennings One Acre on the west side of the the path now Speers One Acre next adjoining to the same acre of Speers So remaineth to the Parsonage Barn of Yeovil 98 Acres 3 Yards. From Marshweeche to Brimsmore tree and from thence to Pickedweech being Oxen Furlong and wide Gore containeth 45 Acres whereof belongeth to Pitney 15 Acres 3 Yards Viz - on the East side of Jno Diers close 3 Acres and half, and 11 Acres lying next to John Diers close saving one Acre and 3 Yards at the end of Oxen furlong and half an Acre at the lower end thereof so that there remaineth to the Parsonage Barn of Yeovil 29 Acres and One Yard. From Brimsmore Tree up to Snelling cross near the Windmill and from thence to Thorne way and from Thornway to the said Brimsmoretree containeth 62 Acres whereof to Pitney 37 Acres and half, Viz - One Acre in Lionel Harrisons close in the East side in Mr Moleins close one acre and half in the West side 2 Acres without the Hedge of the same close and 2 Acres in the same Furlong next the way saving 2 Acres. 3 Acres at the head of the same furlong, One Acre at the head of the said 3 Acres, 27 Acres and half lying together bounding to the way which lieth to Thorne, So there remaineth to the parson of Yeovil 24 Acres and half. 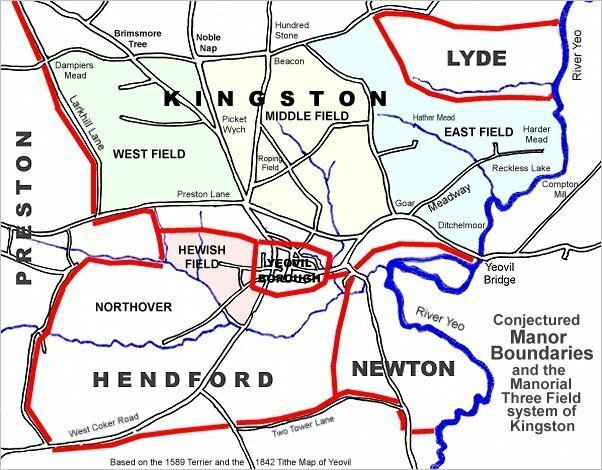 From Jacobs Door being the Townsend of Kingston to Preston Townsend and up to Dampiers Mead corner and from thence to Brimsmore Tree and so to the Townsend of Kingston again being the Circuit of all the west field containeth 310 Acres whereof 21 Acres are Meadow 14 Acres pasture and the rest Arable. Whithin this compass there lieth to the Parsonage of Pitney of meadow, and arable 115 Acres, whereof 19 Acres are meadow lying at Brimsmore in Dampiers Meadow and Andrews Meadow, the rest Arable lying in Ewardons Close at Brimsmore of the same land, 5 acres and half in Valentine Jacobs Close 12 Acres in the field in the same furlong to half an acre of Jno Hacker the Elder lieth 13 Acres and half. In the field in the same furlong to Goldthorne 3 Acres, all bounding upon Brimsmore Moor 6 Acres lying together bounding upon William Kings close next to Brimsmore way, one acre in the same furlong bounding upon the way to Brimsmore, in the next furlong upon the (word illegible) in N Jacobs close, One Acre bounded upon Ewardons Close distant from Preston way, the Quantity of 6 Acres, in the field in the same furlong 4 acres and half under Jno Nicles's Lodge. In Jno Nicles close in the same furlong to the Twy-field wale. 8 Acres, in the next furlong called Rowell One Acre bounding upon N Jacobs close distant from Preston way 8 Acres, In the same furlong 2 Acres betwixt the lands of Mr Compton late Mr Carrents in the East, and the lands of Benj Haines in the west part 2 Acres and half, in the same furlong at Twyvale wale lying betwixt them One Acre. In the next furlong called Threshers bush one acre and half lying in George Harrisons which his Easter hedge standeth upon the furlong next Preston way. In J Newmans close one Yard and half in William Fords close 5 Yards in the East side of the Twyvale. in Thos Whibbirs close in the west side one acre in the East side 3 Yards, next the hedge one yard without the hedge One Acre in the west side of William Jennings land bounding upon the way at Colsons, with one Acre in Bowdens land ion the west side at Clesham in the East side of Jno Nicles land one acre under Nicholas Hills close hedge behind Delwoord 5 Acres. In Thos Williams Close at Pickedweech in the West side 5 Acres. in Elizth Diers Close next the way 5 yards, upon the Hyde 18 Acres that beginneth next Jno Nichols close, one acre between and cometh down next to Dalods hedge, 2 Acres and half between, so there remaineth to the Barn 195 Acres. containeth 240 Acres, Viz - 30 Acres Mead 60 acres arable, 110 Acres pasture and of Sheeps leaze and other Furzey Grounds 110 Acres, the Tithes thereof belongeth all to the Parsonage of Yeovil. with the Freeholders Ground which lieth within the bounds of the same Manor containeth by Estimation 900 Acres Viz - Arable land 500 Acres, meadow 30 Acres Pasture 70 Acres and Furzey and Down, now used for Sheep pasture 300 Acres. 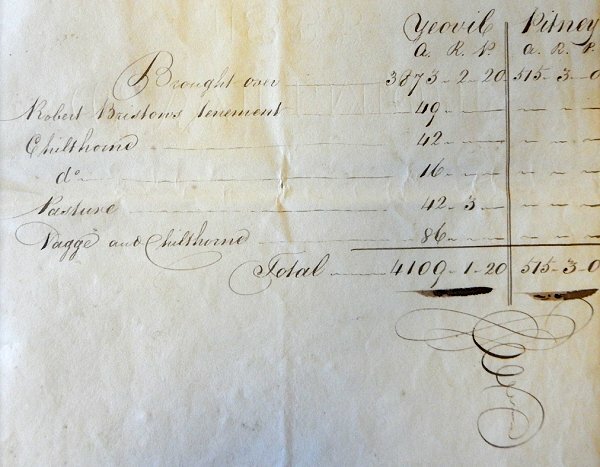 All the Tithes of Corn and Hay of the whole Manor to the Parsonage of Yeovil. Memorandum - That the Tithes of one acre of Pasture lying in a close near Paviotts Mill called Culverhay on the East side of the Close and of 2 Acres of meadow lying beyond the Brook there in a close called Blomore belongeth also to the Parsonage of Yeovil. Marsh is bounded from Hundred Thorne to Mr Hawkers Windmill with the highway on the south, the Farm of Stone on the East the Farm of Vagg and Okeley lane to Okeley hedge on the west and Okeley Draycott and Sock on the north Whereof the Tithes of Corn and Hay of these Grounds hereafter named & expressed do belong unto the Parsonage of Yeovil, except as is hereafter Excepted. Longcroft of 9 Acres one yard of Pasture by Estimation lying in the Great Close next to Downditch bounded betwixt 2 Acres, belonging to the Parson of Pitney on the East, and 3 Yards belonging to the same Parson on the West. (Margin note - These things that are here excepted belong to the Parson of Pitney). Of one close called the Sheephouse close, counted by Estimation 4 Acres arable land and 2 Acres of Pasture. Of the Moiety or halfendeal of Four Closes of Pasture now in the several tenures of Thomsin Phelps Widow and Thomas Jacob by Estimation 14 Acres Thos Jacob and Matth Darby. And of the pasture and furzey Ground because the Vicar of Yeovil hath the Tithes thereof until it be sown or converted to Meadow. There are lying within the said circuit of Marsh of old Pasture Ground two closes called Foxleaze & Flippenpitts alias Sixmenlease by Estimation 60 Acres. Which hath not been Eared, Sown or mowed at any time by the remembrances of any of us and we know not how much hereofs belongeth to the Parsonage of Yeovil, or Pitney. Vagge and parcels of land in Chilthorne, the third part of the Tithes of the Corn and Hay thereof belongeth to the Parsonage of Yeovil. Imprimis - Mr Hawkers farm in Vagge contain by Estimation 200 Acres Viz - Of Meadow 30 Acres, of Arable 80 acres Of Pasture 90 Acres. Of 8 acres of Pasture and 3 Acres of arable land parcel of Mr Hawkers Farm now in the tenure of Amos Ailford Clerk. It(em) - the third part of 3 acres of Arable land in the south side of Vagge in the tenure of Mr Hawker. Of 55 acres lying in Vagge now in the tenure of William Slade Gent. Viz - Of arable 23 acres, of Meadow 12 acres, Of Pasture 20 Acres. Of these Parcels of land lying in Chilthorne of the same Wm Salmons Viz - of 2 acres of Mead in a close called Rotherhill on the North part of the same close. Of 7 Acres and half of arable land in two closes adjoining to his backside. Of 2 Acres or arable land in Girlefield in the uper furlong. And of 4 Acres of Arable land in the West field. Of Robert Jeanes the Younger his tenement in Vagge, Viz - Of two closes of Pasture there containing by Estimation 10 acres. Of these parcels of land of the same Robt Jeanes lying in Chilthorne Viz - of 5 Acres of meadow in a close called Nethermere. Of two acres of Pasture in the middle of a close called Blackhill and of 5 acres of Pasture in one close called Holcombe lying in three several places, Of three yards of Pasture lying in a close lately inclosed out of Girlfield on the east side of the same close. Of 4 Acres of Arable land in the West field 11 acres and half of arable land in Girlfield. Of one acre and half of arable land in East Longland Floodgates & Angelscraft in three several places. Of one acre of arable land in Hook. Item there is allotted to the Parsonage of Yeovil the third part of three yards of Glebe meadow in a meadow of Jno Rainolds called Dole out of the tenements of the said William Salmon and Robt Jeanes for the Tithe of their Stockmead. Of one close of Meadow containing by Estimation5 Acres lying on the West side of his House beyond the way. Of one close of Arable land lately inclosed out of the Field adjoining to his backside containing 10 Acres. And of 4 Acres of Arable land in the middle field lying in four several Places. And of 7 Acres and half of Arable lying in the South field. Of one other close of Pasture called Rushley containing by Estimation 15 Acres now in the tenure of John Hodges of Suston. Of other Close of Pasture called Rushley containing 27 Acres now in the tenure of Thomas Phellips of Montacute, Esquire. The pasturage of the Oxen and half a Beast, in the common leaze called Chilthorne now Leaze there appertaineth to Robt Jeans's tenement 5 and half and to Robt Jeanes the Elder 5 belongeth to the P(ro)vost of Stoke. Jo Hodges tenement 2; to James Hunt and John Phillips 4. Viz - to each of them 2 belonging to Whitehall at Ilchester.